The London eating scene although constantly evolving, seldom brings something truly new into the fold. However when it comes to cornmeal crust pizza, I can safely say I did not know of its existence before Otto sprang up on Chepstow Road, three bus stops from my flat. Indeed Rich and Tom, who brought the concept over after discovering it in Oregon, had a hard time convincing investors who couldn’t fathom a pizza which couldn’t be pigeon-holed into either a Pizza Hut or Pizza Express mold (having tasted it, I can attest that it is neither). But the young 20-something owners prevailed, and a fortnight ago opened quietly to a launch crowd of friends, family and passer-bys. Since then word-of-mouth has been good to them, and Rich himself expressed surprise at how quickly business has taken off (he had secretly hoped for a slow start to allow them time to find their feet). 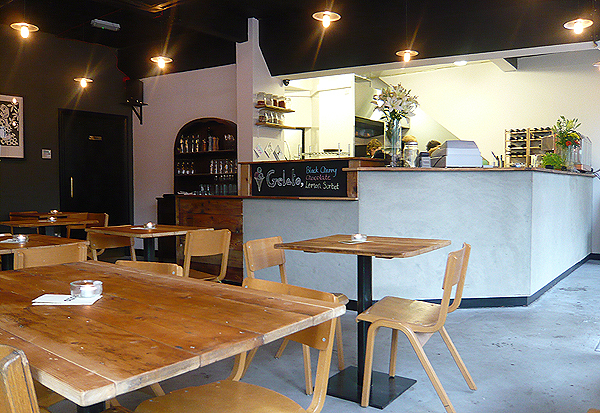 The space is sparsely decorated but welcoming, and the menu is equally simple, with a choice of 3 salads, 6 standard pizzas and 4 specials. The wines are cheap and cheerful, with the Aussie shiraz that we ordered being the most expensive red on the list, ringing in at £20. We wanted to sample as many of their toppings as possible, so we opted for six single slices (£3.50) rather than two halves (£10) or a whole (£18). 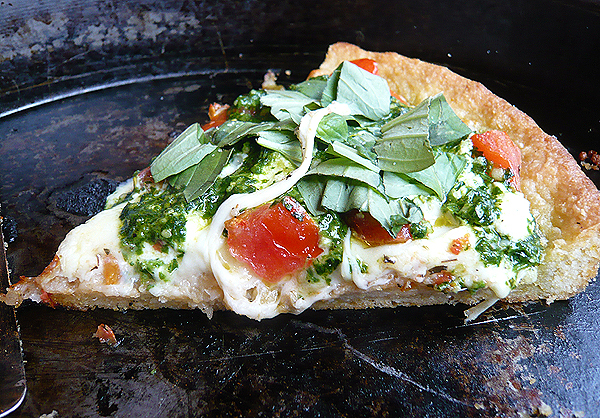 The Pesto and Ricotta was a real slice of summer – freshly-made spinach pesto, ripe tomatoes, torn basil leaves and a mix of ricotta, fontina and mozzarella cheeses. 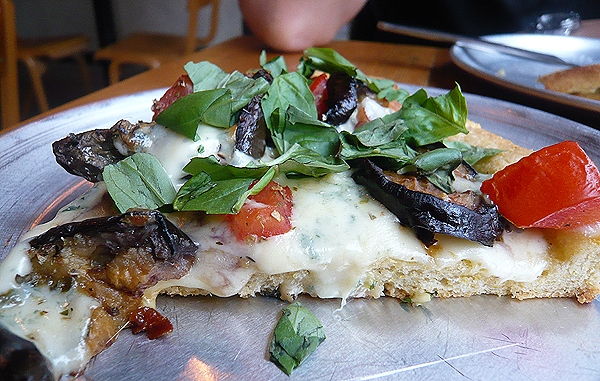 The light bruschetta-like flavours partnered and contrasted well with the crusty robust base. 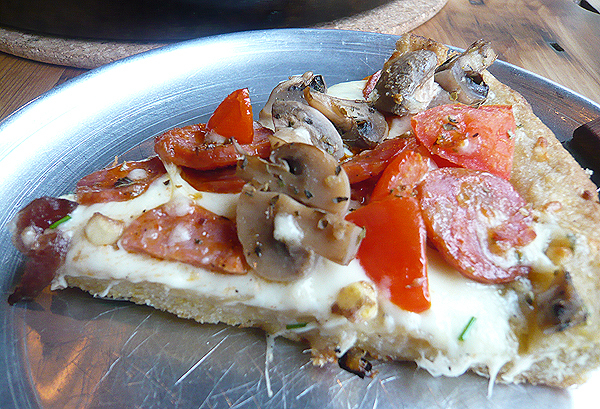 It was actually nothing like pizza; I would liken it more to a tart or quiche, as the base had a similar texture and density to that of shortcrust. Interestingly, despite being rather filling, it felt a lot healthier going down – makes sense really as it has more fibre than traditional pizza dough and unlike shortcrust pastry, doesn’t contain copious amounts of butter. 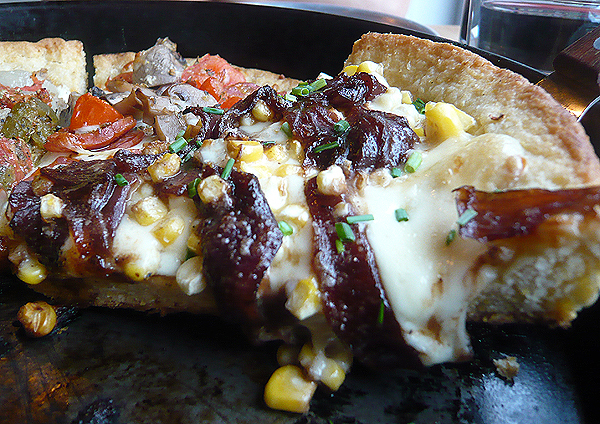 The Balsamic Red Onions and Sweetcorn slice (sticky caramelised onions, fresh corn kernels, smoked mozzarella and chives) was also lovely, with the sweet corn kernels played off the cornmeal crust nicely. Strangely it was the familiar toppings which didn’t work as well. 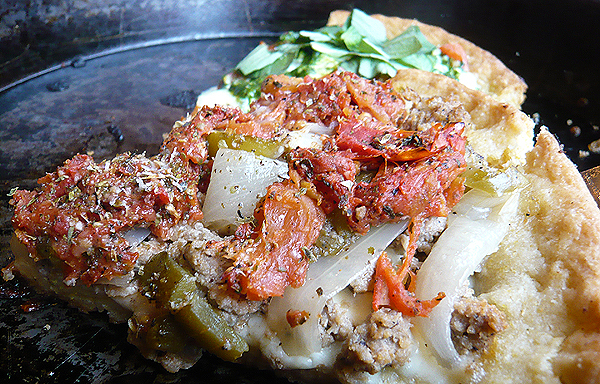 The Fennel Sausage with Green Peppers, Onions, Mozzarella and rich oven-roasted Tomatoes was undeniably tasty, but needed a more neutral base to balance out the strong meaty flavours. For similar reasons the Pepperoni, Mushroom, Tomato and mozzarella-topped special was unsuccessful for us (even B, typically a true fan of the pepperoni and cheese combo, agreed). Rich was actually thrilled when we told him this, saying he has been trying to guide customers away from the more conventional flavours traditionally associated with pizza, but sadly thus far to no avail. The Aubergine pizza wasn’t bad, but needed tweaking – the roasted aubergine was soft and smoky and would have been perfect against the bright flavours of basil, tomato and mozzarella; instead it was over-powered by the addition of the pungent blue cheese that threw everything off-kilter. 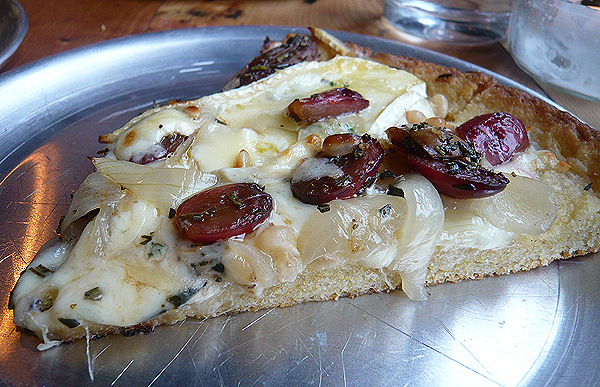 On our bubbly waitress’ urging, we ordered a slice of another special – the Brie and Grape. I had not expected to like this as I generally have an aversion to fruit in savoury dishes but it was actually really good. The grapes were sour with a faint sweetness, and the acidity offset the creamy brie beautifully. Three slices each was just about right, but we did find room for a couple of scoops of Chocolate and Dark Cherry Gelato. 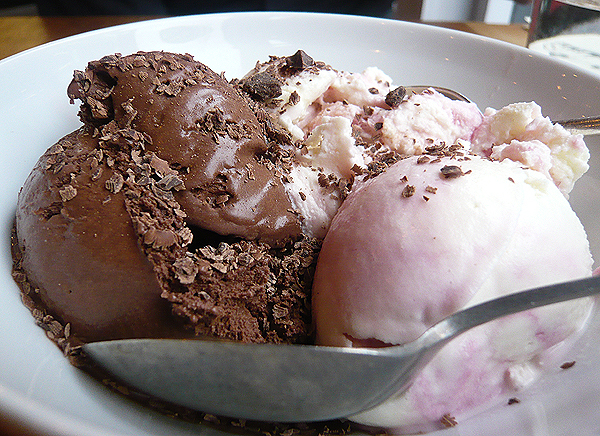 The latter, laced with plump pitted cherries was particularly good. We enjoyed the laid-back atmosphere, friendly banter with the staff and most definitely will be back. 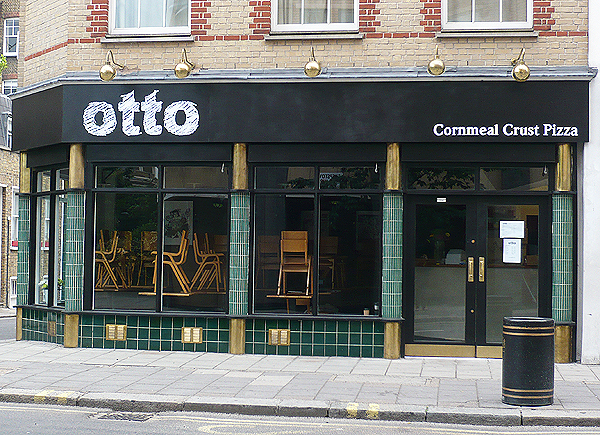 However the pizza, good as it was, definitely isn’t something I could eat every day (granted, that’s a matter of taste – apparently one punter has been in 6 days out of 12 since Otto opened!). To find out if it’s your bag, you’ll just have to head down and try it for yourself – just don’t go expecting pizza as you know it. note: Otto is currently opening only in the evenings, but they plan to start serving lunch next Saturday and on weekdays soon after. ~ by gourmettraveller on June 19, 2010.
fantastic write up, will have to try it ASAP then..looks like an exciting addition to the restaurant scene! fabulous! I’ve passed Otto a few times on the bus in the past few weeks and have been quite intrigued. Will definitely have to get the tomato basil pizza. Was this an invite to review? No, it was not. I pay for all the meals I review on the blog and visit on my own accord. Great read:) The pizzas sound fantastic!